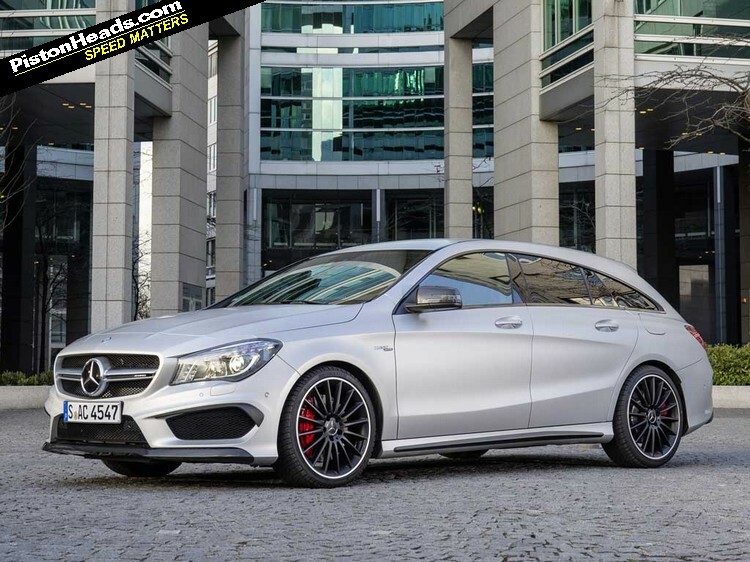 AMG's '45' family gains yet another member - is it possibly the best yet? 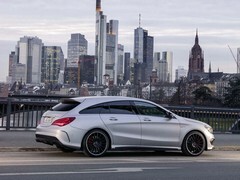 Even when every automotive niche seemed filled the new CLA45 AMG Shooting Brake stands apart from the crowd. The nearest potential rival in the form of the Golf R Estate will be significantly cheaper so as a small, expensive and properly fast estate car, only the less practical Audi S3 Sportback can come close. 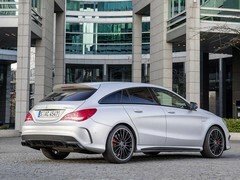 The baby 'Brake gets off to a great start too, managing to just about carry off the junior CLS63 vibe successfully. 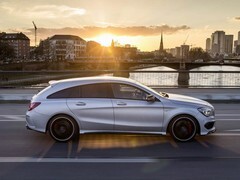 A technologically exciting 360hp motor, squeezed into a small, discreet and elegant estate car with all-wheel drive and the aerodynamics of a cruise missile. You have to agree, it's an appealing package. Plain A, GLA, CLA and now this - choice is yours! 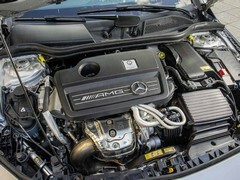 The M133 AMG four-pot remains unchanged, having been used in three other Mercedes-Benz compacts already. 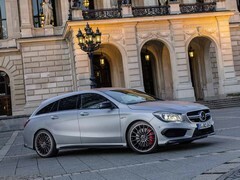 Now the Affalterbach team has completed the A-Class AMG set, with 360hp and 332lb ft taking on an extra 30kg in the Shooting Brake compared to the CLA saloon. The spec sheet will tell you that this is a whole tenth slower than its four-door cousin but sub-five to 62mph feels rapid enough. Every satisfying click of the machined aluminium shift paddles will bring you closer to this car's true character: a demolisher of back roads and roundabout sprints. With the three-mode drive button cycled through Comfort to either Sport or Manual, the shifts change from slightly lethargic to just quick enough. Damning the manual shifts in the seven-speed DCT with faint praise might feel a little unfair, but if you leave it in Sport/auto things do get worse. Despite the reserves of torque available, the 'box does insist on spending valuable overtaking time dropping an extra cog or two when you least expect it. A gentle squeeze of the pedal, intended to release some of that lovely turbo mid-range, can often result in a momentary lag in proceedings. 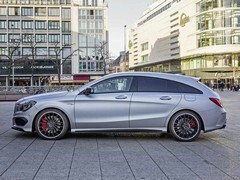 Just as you wonder what's wrong, the Shooting Brake erupts forward in a cacophony of noise and acceleration two gears lower than you needed. But even these little episodes of unintentional acceleration do little to remove the grin from your face. Nothing has changed under here - good! Blessed with the opportunity to blast up to the top of the Feldberg (a small, snow-covered German mountain), the AMG really impresses. Through hairpin bends, it's really alive and feelsome. While the cars are fitted with Dunlop Sport Winter tyres, the amount of grip available is still quite remarkable. 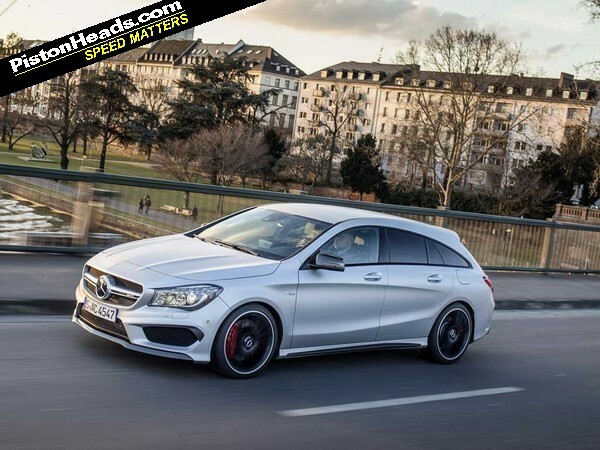 Compared with the regular non-AMG CLAs, this version doesn't just benefit from different spring rates and dampers. The wishbones, pick-up points and even steering linkages all get fiddled with, as well as the rear subframe bushes and various other bearings. 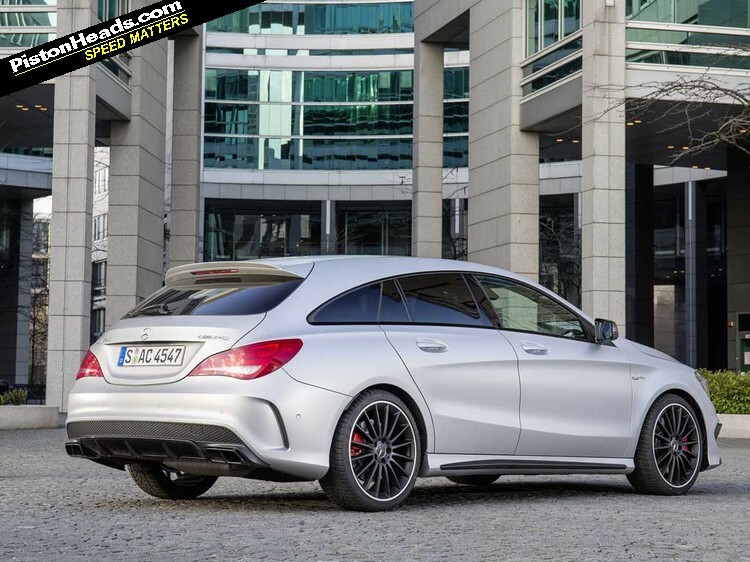 This AMG CLA is tuned to be a little softer than the hatch, though still stiffer than the GLA45. 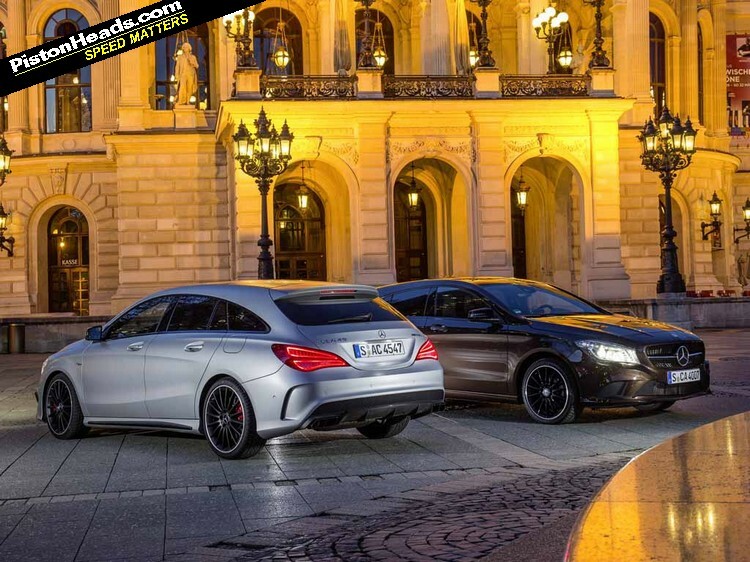 The net result is that where the standard CLA Shooting Brakes gently change from soft and luxurious to flustered and rolling, the AMG version swaps from taut and comfortable to exciting and fun. Uphill hairpins seem to be the strong point of the 'Brake, as the on-paper front-driven bias is never really felt. In Sport mode, the transition from front-wheel drive to a perfect 50:50 split is almost impossible to perceive. 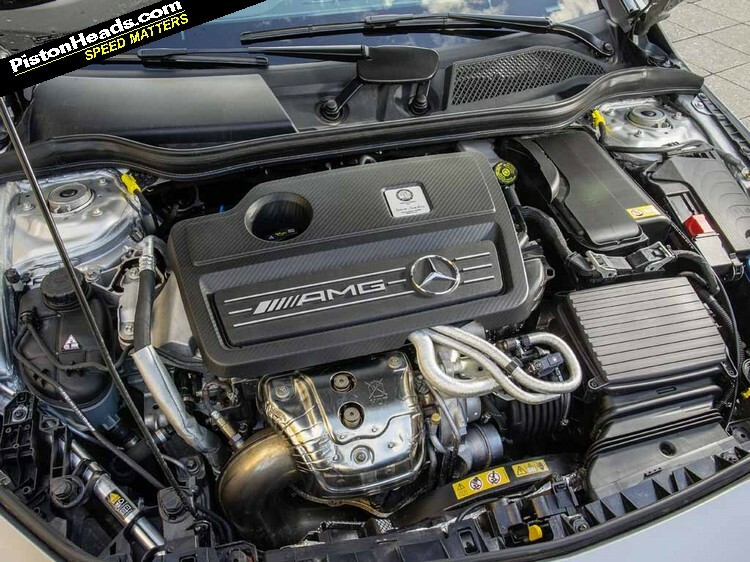 Only the results are obvious, as the AMG steers out of the corner under full acceleration with nary a wobble from the wheel. There's little chance of the rear breaking loose (more's the pity) but unlike older Haldex offerings, it never feels like an overpowered FWD car either. Put the engine, the satisfying shifts, the precise steering plus the amazing grip together and you have a recipe for turning around and driving it all again. Which we do. Several times. Point to point soon becomes point to pointless as the AMG roams a seemingly random pattern through the hills, just for the sheer hell of it. There are some issues encroaching on the dream though. The downhill sections reveal a rapidly softening brake pedal, maybe not wholly unexpected considering the demands, but still disappointing. We drove two cars on the launch, one already inflicted with a soft pedal by a previous leadfoot, and one that started well but ended badly. 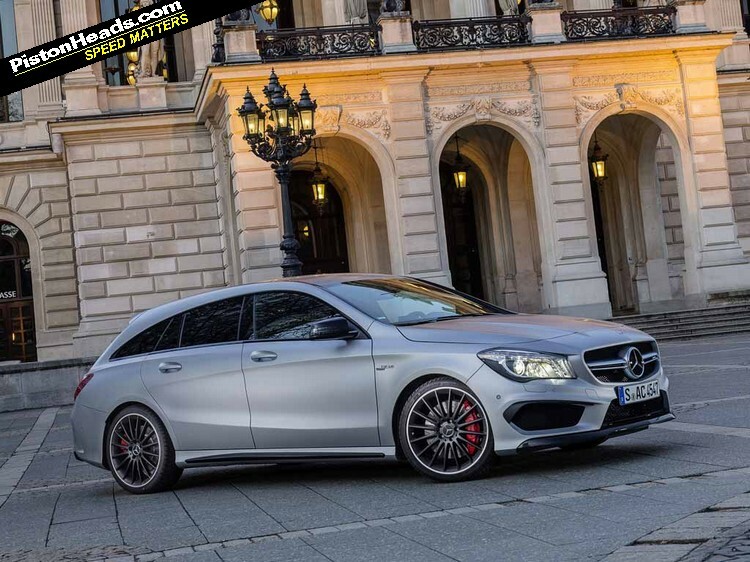 On paper those huge AMG four-pot calipers are gripping some fairly meaty 350mm and 335mm discs. Enthusiastically pedalled or not you'd expect them to cope and AMGs aren't usually wanting here but maybe uprated fluid and pads would fix it for the hoons. Less easily remedied is a frustrating mix of high-end Affalterbach luxury, sprinkled with cheap pieces of natty black trim and nasty feeling air vents. And because the car is incredibly aerodynamic - just 0.26cd - the wind noise at autobahn speeds is so negligible that you can hear a couple of different resonances and vibrations emanating from the dash under load. Not especially Mercedes, it has to be said. Reference also the steering wheel. Its width and the synthetic suede at nine and three is actually perfect, but the shiny leather above and below whispers and rustles at every passing touch like it's made of polished greaseproof paper. 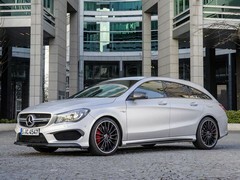 In contrast to the soft Alcantara-like pieces it's as if a £25K base model is trying to burst out from inside the AMG. ...and it's not so cheap. 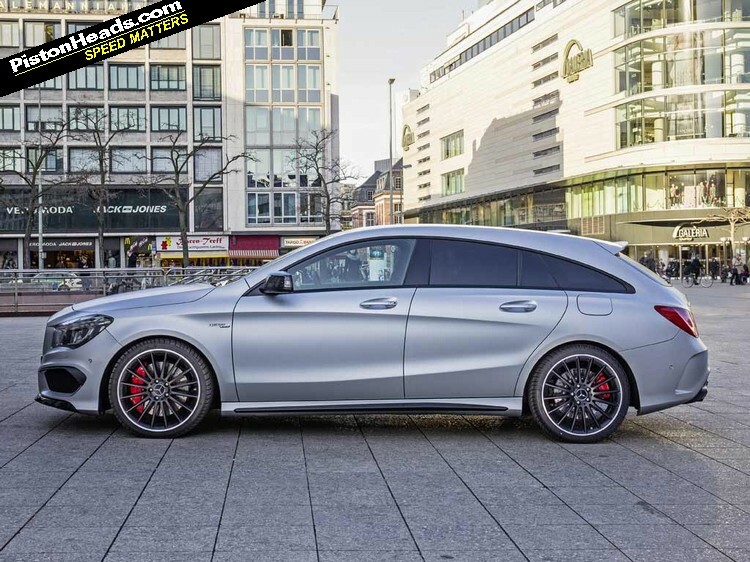 At £43,120 before options, it's hard to ignore the price of the Shooting Brake. Add some of the tastier ticks (exterior carbon fibre £2,550, AMG exhaust £460, steering wheel £570, suspension £765, COMAND entertainment £1,870 and surround sound at £680 just for a start) and that figure begins to explode exponentially skyward. 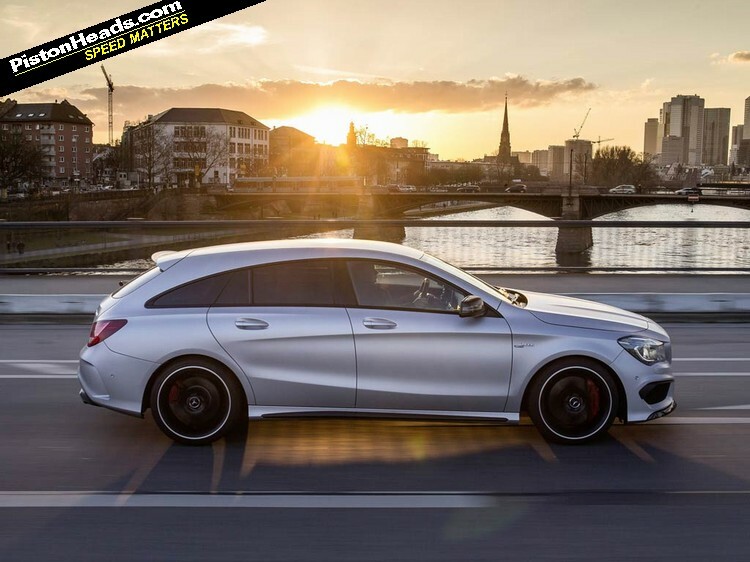 Rather concerning when you remember that a five-door M135i starts at more than £10,000 less. That could leave you with a lot of headroom on the options sheet for the BMW. And let's not forget that while the 'Brake is quite practical, it's still not a 'real' estate car. 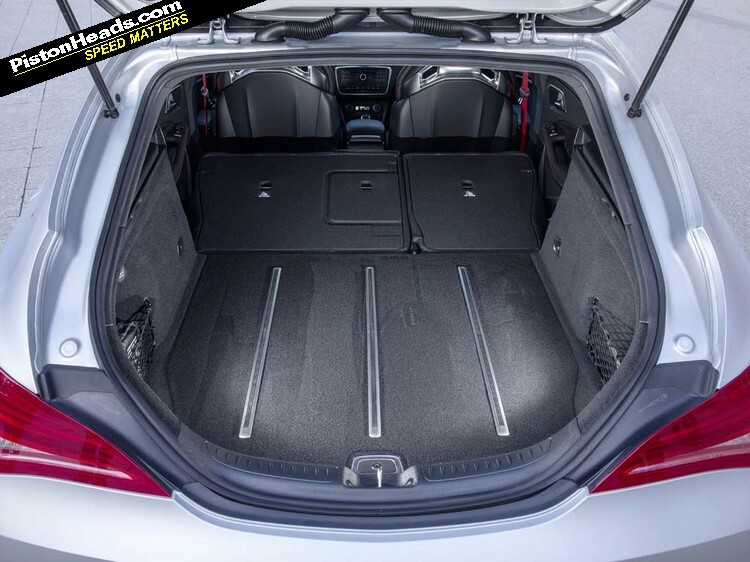 With a hatch that's overly narrow and a little high, you won't be throwing much bigger than a medium sized dog or a very small bicycle in there, despite the figures suggesting otherwise. Seating adults in the rear is easy enough. 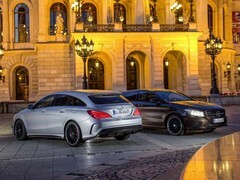 Though truth be told, the net gains over a CLA saloon are a mere 20mm of headroom for the passengers. 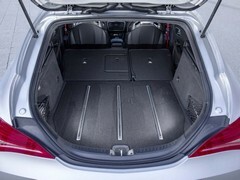 The boot is obviously more impressive, up 154 litres to 495 litres with the seats up and nearly 1,500 litres seats down. 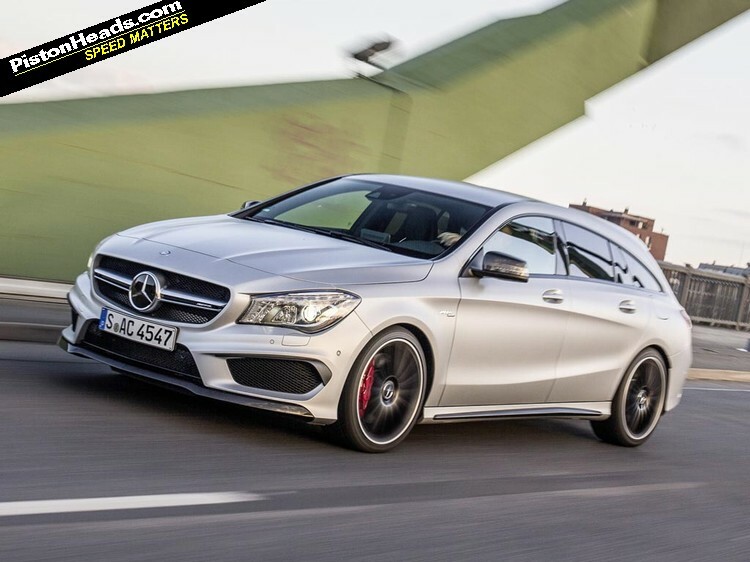 Off the back of all that, it would be easy to take this as a lukewarm response to the Shooting Brake. Far from it! 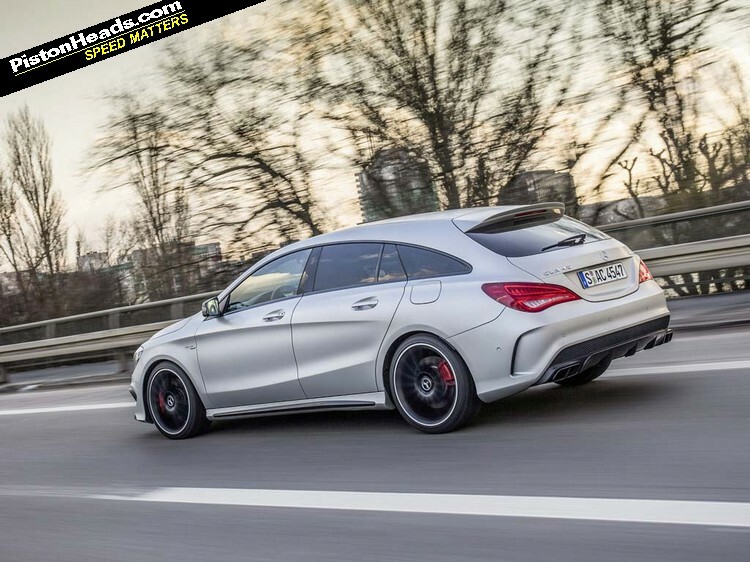 Fans of small, silly and very exciting estate cars (first-gen Subaru WRX estate, for example...) will no doubt forgive the little AMG its faults and flaws, finding it perfect for purpose and worth paying a premium for. 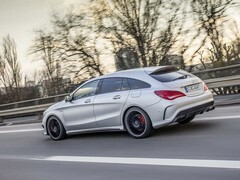 But it's such a specialised thing that its rivals can't be restricted to similar cars - they could be anything from the aforementioned S3 or 135i to a Leon ST Cupra, a Volvo V60 Polestar or an Octavia vRS 230. 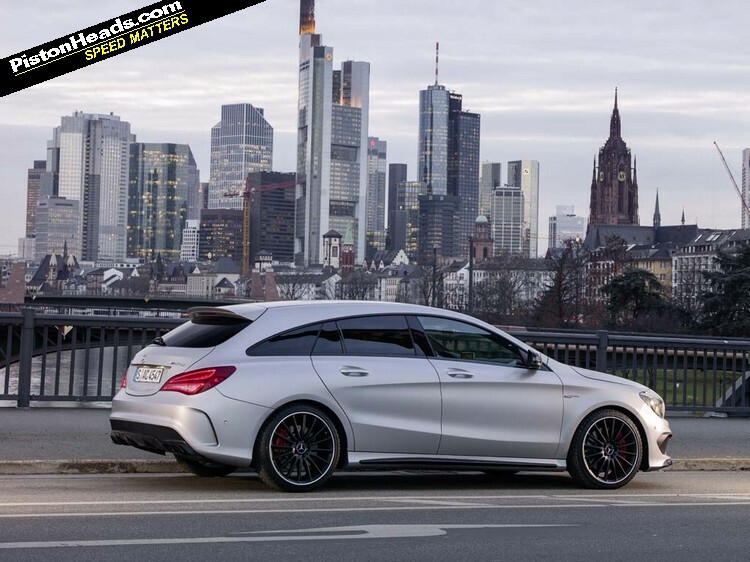 Meaning from an apparent niche of just one the Shooting Brake actually faces a bigger and more diverse field of rivals than you might imagine. Never mind within the '45 family itself. 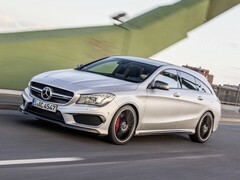 Choice is a good thing though and the 'baby' AMG range is suddenly looking a lot more grown-up. For the same money I'd rather have the exclusivity of the V60 Polestar. Just not sure can get my head around a 40k+ 4 cylinder. Easily the nicest looking of the 45 family so far (not particularly hard, I'll admit). Looks much better than the initial pics a few weeks ago. Looks much more complete as a design. The back end of that car is horrendous. What an overhang. It looks like a dog squatting for a s t.